Hi everyone – sorry about my lack of posts lately, but I am in the midst of creating 2 or 3 longer, more arduous ones and so my page has been blank for a bit. I had a thought this morning when I woke up that perhaps a quick but very useful post might be in order. One of the quickest, but perhaps most daunting, tricks to making your room more interesting – is to set a piece of furniture on an angle. Some people argue that it takes up space and while that’s true – what it creates is a more interesting room. I don’t know about you, but I would trade that any day. In my living room, I was just so unhappy with most of the furniture arrangements that I did. I have an L shaped living room/dining room configuration – and it’s one of the most problematic ones to make interesting. 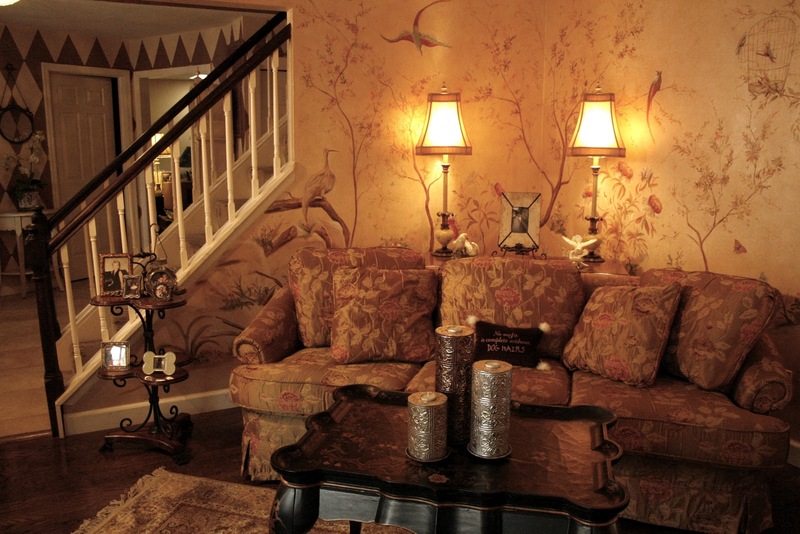 I finally angled my sofa – which then necessitated that I make the corner interesting…so up went the mural. But, if you don’t want to or can’t do that﻿, place a table behind the sofa and plop two beautiful lamps and a floral centerpiece and voila…a beautiful corner arrangement. I also had a problem in that I have a baby grand piano in the living room also. So, directly across from my sofa went my piano – on an angle. I was never happy with any other place that I positioned it – until the angle. I can now play my piano…plus look out the window. Before, I had the piano where the sofa is now and I had to squeeze into the seat, which was in the corner. It was non-functional this way and guess what – I played less! Now, it’s my little music corner…plus there’s more light being by the window and I can see what I’m doing better! So, the angling make my living room more functional as well as more beautiful. I may have a tendency (and as my husband Richard says – an obsession)﻿ with putting things on an angle…but there’s usually a method to my madness. 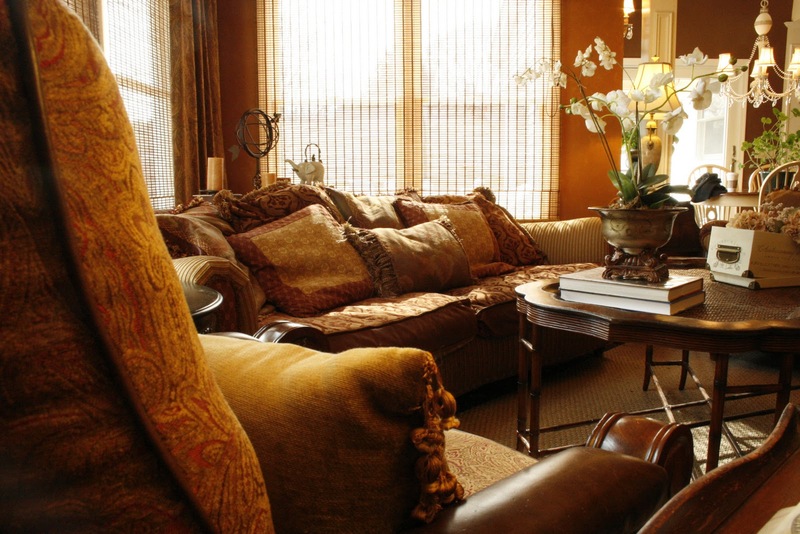 When we did our renovation and added a great room, I was never ever happy with how the furniture looked in this beautiful room. The furniture was beautiful, the wall and window treatments were just as I wanted them – but I thought something was “off” in the room. Because we made the room fairly high – with a cathedral ceiling, the sofa looked too small where it was. This was because it was in front of one of the tallest walls that also had the Palladian window. When I finally angled the sofa in the corner – the sofa was in scale because it now was in front of the lower part of the room. A little hard to tell in this photo – but the wall behind the sofa is 8 feet tall﻿. Before, the sofa was in front of the tallest wall and it just made this rather large sofa – look like a doll house couch. So, in this case, the angling helped to balance the room because the scale of the sofa to the wall was off. Try and experiment with putting some of your pieces on an angle. I think that you will find it definitely makes a difference in the room. Let me know how your room looked afterwards. If you need some help with your furniture arrangements, just give me a call at 631 793-1315 and I’d be glad to help. Weekly Faux Finishing Column Idea: What do you Think? How About a Little Vin Chaud for the Cold Nights Ahead? I chuckled when I read your post. We had a similar problem, all because of a piano… When Sally bought her Steinway B we wre forced to re-evaluate teh furniture layout in our living room. We ended up placing the piano at the north end of the room on a slight angle and “building” the rest of the furniture layout around the piano and the angle. A happy plus is the two sofas in front of the fireplace open wonderfully to the foyer and there was still space for our two bergeres at the front of the room overlooking the flower beds. The rooms I have problems with are the rooms with the fireplace in the corner… They're a touvh nut to crack. PS: Thank you so much for your so very supportive comments on our blog the other day. They were appreciated by both Sally and me. Hey John – thanks so much for commenting. 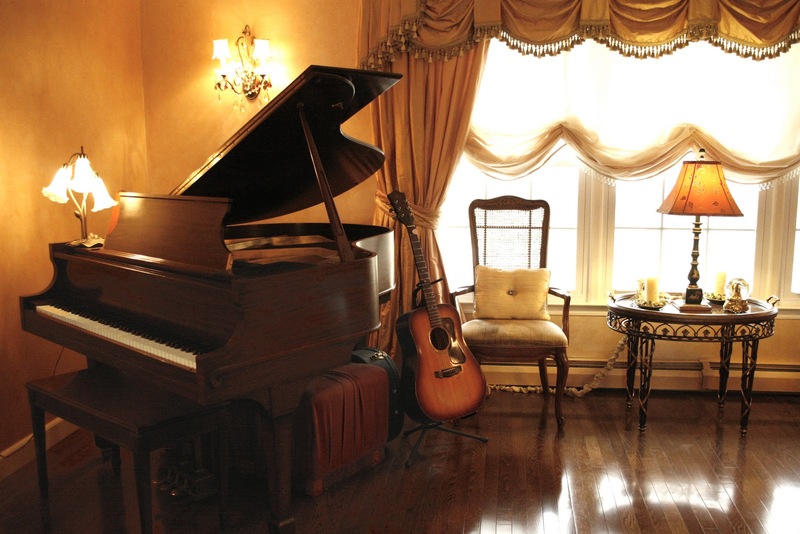 Indeed, a piano will change what you do with a room. But when there's music – there's life, right? What's a little change! I agree about the corner fireplace room being a huge problem. Luckily I haven't come across it yet! Maybe it could be a blogpost that we both could collaborate on! I will continue to view and comment on your blog. I found that you and Sally are doing really beautiful work. I have to scope out your website and your other blogposts for more of your inspiring projects. I was glancing around your blog and found Livingglass. What a fabulous vendor. I have a client who is pretty contemporary and he wants something different in his powder room. Seems like Livingglass would be the ticket. Thanks for posting about them. 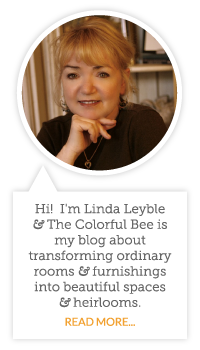 Hi Linda, I love your blog! My problem was what to do with my 8 piece U shaped couch when my husband brought in the Christmas tree. Fortunately, I read your blog. I placed 6 pieces in an L shape, leaving room for the tree, and then placed the 2 remaining pieces on a diagonal. The room looks wonderful and very interesting. Thx! Hey Gini – I am so glad that my post helped you! Maybe you can send me a pic or two and we can put in on my blog!